Well, if you got our card, you saw that we sprung for a 42' boat. It's an older boat, a trawler style (read slow! ), but it has lots of room, was in good condition, and the guy was selling it cheap! It’s a 1983 CHB. Besides being pretty spacious, it is very stingy on fuel. 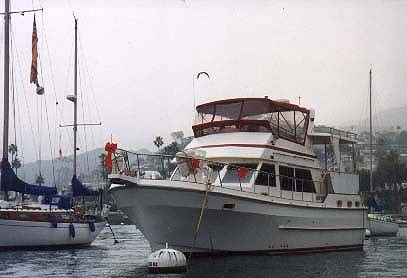 Each day, as fuel prices rise, we pat ourselves on the back for having made a good decision regarding this type of boat. 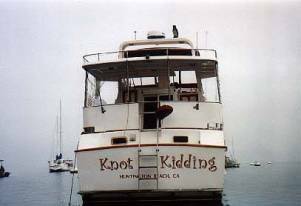 It has smaller diesel engines, (goes around 9 knots, takes about 3.5 hours to Catalina Island), but it does it for less fuel than Scuba Due! We spent the first couple of months just enjoying the boat as is. We will do lots more this winter to get her looking her best. The motors were in great condition, and so far, only one major repair (that I did with my neighbor so I'd learn) has needed to be done. Haven't even stopped at the fuel dock yet, maybe sometime in spring?!? These photos were taken in December at Avalon which is the main city at Catalina Island. Though it looked cloudy, it cleared to glorious, sunny, Southern California day. That’s about the only time we go to Avalon, which can be terribly crowded in summer. Winter is our favorite time there, and you can actually get service in the restaurants! I guess I’ll start with the hard stuff. Ed and I started baby making the super scientific expensive way. Let’s just say we just about maxed out our options for a biological child. I would like to take this opportunity to thank some special people in my life. My Mom and Dad were very generous this year to share Grandmother’s estate. This money we set aside to help with the baby stuff. That is with the big baby, the boat and the small hopeful baby, which is yet to be seen. The other special person in our lives is Ed’s Aunt Eleanor, who has been very kind to Ed and I in the past years. Her generosity has enabled us to save for retirement and fulfill our future family and fun plans with out too much regret. Work is the same very busy and difficult at times with a lot of new staff. I’m becoming a senior member. WOW…….. I have picked up a lot of extra shifts and will think about a second job the beginning of the year. Currently our hospital is paying part-time employees an additional $80 for every 4 hours worked extra. So for now, you could call me a working fool. It’s great seeing those big checks! Ed and I are feeling old this year. We are actually going to meet the requirements to write off medical expenses. As the time gets closer we have started to celebrate additional medical dollars spent. I know it is kind of weird, but we are hoping this is the last year we will take advantage of this opportunity. My Birthday was celebrated in France this year!!!!!! I was so excited to travel to Europe. I only wish I had traveled sooner. I found myself interested in History like never before, who wouldn’t, walking around buildings centuries old. It’s just an awesome experience. Just don’t ask me what a French person looks like! It all seemed like a melting pot of cultures. My favorite part had to be the time we spent in Dijon. We had a fabulous wine excursion and now know how to taste wine like the French. Before our visit to Dijon I made my mind up I didn’t like French wine. I guess there is always an exception. We now have a wine captain full of our favorites. Well, repeat of 1999 with another slow year on the scuba and fishing side with all the baby making and home improvements. We did make a few trips over to Catalina and did some nice diving. And, we now have the kitchen finished – the shades are in! Now time to work over Ed's office, it got yukky over the years. Wouldn't you know it, though, as soon as I get the office stuff crammed into the little bedroom and the ceiling off, I get a hernia! Oh well, work will go slowly as always! Speaking of work, it has been going great: looks like we signed a very nice big deal near the end of the year, and our partnership with a web design company has been doing great, too. Working on Internet software has been fun and challenging at the same time. Lots of new stuff for 2001.